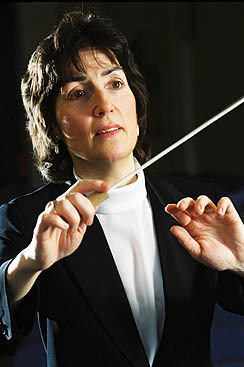 In addition to providing training and tuition Denise is regularly conducts both amateur and professional orchestras and ensembles. Some of the groups with whom she has performed are listed below. You can contact Denise below if you would like to engage her to conduct. "At Cheltenham Town Hall, Denise Ham conducted some 80 of the best local players so that they became one enthralling instrument able to move hearts." "Nothing could have been more professional than the superb string playing from these mature but still youthful players...Conductor Denise Ham knew how to let the music breathe without losing control of phrasing and dynamics." "Dazzling Debut for Youth Orchestra ... under her direction the strings were especially impressive - well-balanced, nicely focused and always perfectly in tune. Soloists from woodwind, percussion and brass played with flair and confidence." "Saturday's performance of my Concertantino was by a long way the best I have had. Your tempi were exactly right, and so was the spirit of the whole thing...Thank you for all you did to bring it all to life so marvellously."